Annnd here we are with buttermilk bread: take two. I’m not quite sure how we wound up here again, except that I wanted to make bread to go with that soup and Chris was mesmerized by the idea of adding a potato to bread. So off he went to buy buttermilk while I boiled up carbs to put in our carbs. Not that I’m complaining. It’s hard to say how this compared to the plain old buttermilk bread we made last time, since we ate them about a week apart. Also, I made the mistake of cutting into the bread right out of the oven (rookie mistake), which meant that basically all the slices smooshed down into themselves when I cut them because it was still warm and mushy. 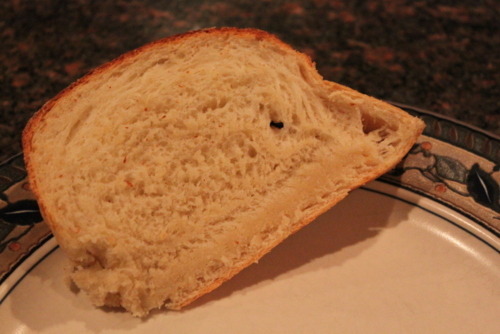 Luckily, though, we still had another loaf to contend with. Bonus points for this one: bigger yields, baby! While I can’t say whether or not this is better than our last recipe, it was definitely yummy. It’s hard to put my finger on what, if anything, the potato added to the flavor, but it was nice and plush and soft, anyway. And the crust right out of the oven was killer. Killer, I tell you! 1. Peel the potato and cut into large pieces. Place the pieces in a saucepan, cover with water, bring to a boil, and cook until soft. Drain, reserving the liquid, and add water to the liquid as necessary to make 1 cup. Mash the potato and set aside. 2. Warm or cool the potato water to 105 to 115 degrees. Pour the warm water in a small bowl. Sprinkle the yeast and a pinch of sugar over the surface of the potato water. Stir to combine and let stand at room temperature until foamy, about 10 minutes. 4. In a large bowl using a whisk or in the work bowl of a heavy-duty electric mixer, combine the yeast and potato mixture with 2 cups flour. Beat hard until smooth, about 3 minutes. Add the flour, 1/2 cup at a time, with a wooden spoon until a soft dough is formed. 5. Turn the dough out onto a lightly floured work surface and knead about 5 minutes, dusting with flour only 1 tablespoon at a time as needed to produce a smooth and springy dough. Do not let the dough get too dry by adding too much flour. If kneading by machine, switch from the paddle to the dough hook and knead for 3 to 5 minutes, or until the dough is smooth and springy and springs back when pressed. If desired, transfer the dough to a floured surface and knead briefly by hand. 6. Place the dough in a greased deep bowl and turn once to grease the top and cover with plastic wrap. Let rise at room temperature until doubled in bulk, about 1 hour. Do not worry if it takes up to 2 hours. 7. Turn the dough out onto a lightly floured work surface. Grease two 9-by-5-inch pans. Divide the dough into 2 equal portions. 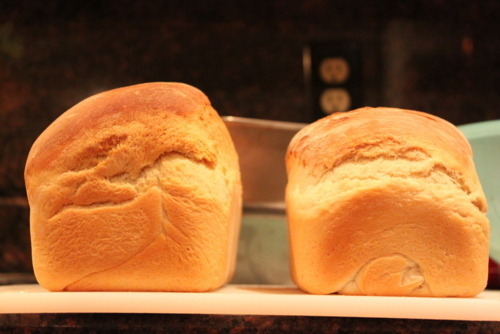 Shape each portion into a rectangle and roll up into loaves. Place each loaf seam side down into the loaf pans. Cover loosely with plastic wrap and let rise about 30 minutes. Dust with flour.